On November 18th I stopped using Twitter. It had been weeks since I had opened my RSS Reader, many months since I quit Facebook and who knows how long it’s been since I watched any sort of TV news. 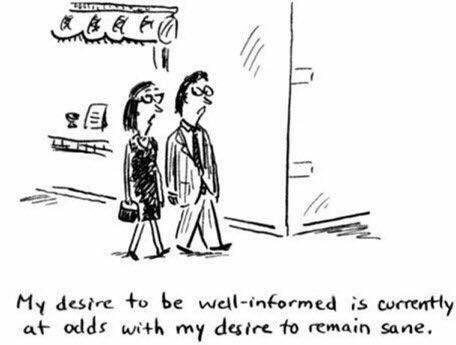 News was overwhelming, triggering, and generally a cause of much distress. Distress I was, and am, unable to endure or process. I am currently avoiding most any media which will present me with current events or news of any sort. I get some music news (RIP Greg Lake…) but generally remain outside of the realm of anything that is happening in the world outside of my home. I can’t avoid all of it but my exposure has been reduced to almost nothing. My social interactions have been pretty minimal anyway but are now currently limited to Gina, my therapist, my Mom and Dad, and my friend Christelle. My world is very small and for now I am managing it. I don’t really think it’s working though. For what it is worth, when you leave the blogosphere for a month or so, your absence is noted and your presence missed. Hope you will keep posting. Thanks Steve. The posting is a whole other and bigger issue. I’ve got a list of stuff I hope to at least toss up soon though.